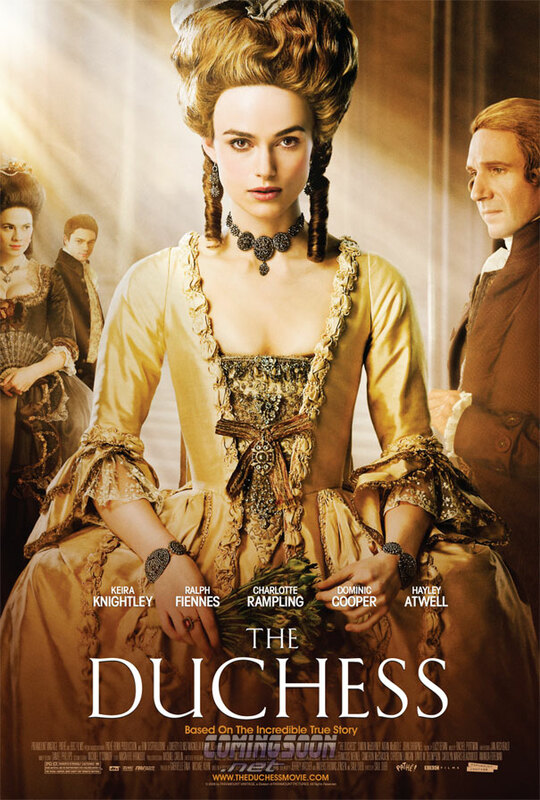 ComingSoon.net is exclusively premiering the new one-sheet today for The Duchess, opening September 19 and starring Keira Knightley, Ralph Fiennes, Charlotte Rampling, Dominic Cooper and Hayley Atwell. Long before the concept existed, the Duchess of Devonshire, Georgiana Spencer (Knightley), was the original “It Girl.” Like her direct ancestor Princess Diana, she was ravishing, glamorous and adored by an entire country. Determined to be a player in the wider affairs of the world, she proved that she could out-gamble, out-drink and outwit most of the aristocratic men who surrounded her. She helped usher in sweeping changes to England as a leader of the forward-thinking Whig Party. But even as her power and popularity grew, she was haunted by the fact that the only man in England she seemingly could not seduce was her very own husband, the Duke (Fiennes). And when she tried to find her own way to be true to her heart and loyal to her duty, the resulting controversies and convoluted liaisons would leave all of London talking. The Duchess is the story of an extraordinary woman who rose to fame by staying true to her passions in a world of protocol, gossip and social rules  and paid the price. Click poster below for a bigger version!